Grijalva, E., Maynes, T. D., Badura, K. L., & Whiting, S. W. (in press). Examining the “I” in team: A longitudinal investigation of the influence of team narcissism composition on team outcomes in the NBA. Academy of Management Journal. Schwaba, T., Robins, R. W., Grijalva, E., Bleidorn, W. (in press). Does openness to experience matter in love and work? Domain, facet, and developmental evidence from a 24-year longitudinal study. Journal of Personality. Badura, K. L., Grijalva, E., Newman, D. A., Yan, T., & Jeon, G. (2018). Gender and leadership emergence: A meta-analysis and explanatory model. Personnel Psychology, 71, 335-367. Grijalva, E., Newman, D. A., Tay, L., Donnellan, M. B., Harms, P. D., Robins, R. W., & Yan, T. (2015). Gender differences in narcissism: A meta-analytic review. Psychological Bulletin, 141, 261-310. Grijalva, E., Harms, P.D., Newman, D. A., Gaddis, B., & Fraley, R. C. (2015). Narcissism and leadership: A meta-analytic review of linear and nonlinear relationships. Personnel Psychology, 68, 1-47. Grijalva E. & Newman, D. A. (2015). The Narcissism-Counterproductive Work Behavior (CWB) relationship: Considering collectivist culture, Big Five personality, and Narcissism’s facet structure. Applied Psychology: An International Review, 64, 93-126. Grijalva, E. & Harms, P. D. (2014). Narcissism: An integrative synthesis and dominance complementarity model. Academy of Management Perspectives, 28, 108-127. Roberts, B. W., Edmonds, G., & Grijalva, E. (2010). It is developmental me, not generation me: Developmental changes are more important than generational changes in narcissism—Commentary on Trzesniewski & Donnellan (2010). Perspectives on Psychological Science, 5, 97-102. 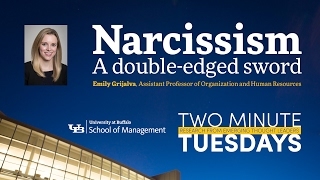 Emily Grijalva on how narcissism varies in men and women and how it impacts the workplace.